Hello! It's time for a brand new Mojo Monday sketch (#248). Carole has created a great sketch for us to play with us! It's also July contest week! I hope you play along for a chance to win some Verve Stamps! I used the Enjoy Today Plain Jane today and stuck pretty close to the sketch (though I reversed the oval/rectangle panels). I stamped the image twice, colored the sun and popped it on top with foam tape. 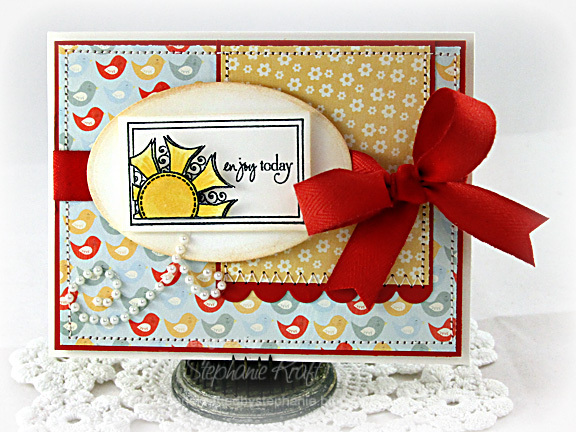 Accessories: Petite Oval Nestabilities (Spellbinders), Small Scallop Border Die (Papertrey Ink), Markers (Copic), Twill ribbon (May Arts), Pearl flourish, Foam tape, Thread, Sewing machine. Very cute card, I love all the little birdies and the sentiment is perfect. What a great card!! Fun papers and the stitching adds so much!! Love the colors. I am a new follower. Come and stop by when you get a chance. So cute Stephanie! Love the bright and cheerful colors!